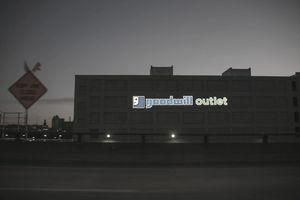 Goodwill Outlet stores serve as the liquidation centers for their retail thrift stores. In most cases, merchandise is moved to an outlet location if it fails to sell within six weeks. Here's the scoop on what you'll find at Goodwill Outlets and some tips to make your shopping trip a success. Once the merchandise is moved to an outlet location, it is typically sold in one of two ways: by the pound (very exciting) or at a reduced per-piece price. Either way, you can expect to pay at least 75 percent less than you would at a Goodwill retail store. So you're talking major bargains here. In some outlets, the merchandise is sorted, but more often than not, the merchandise is simply brought out in large bins for you to sort through. If you like neat and orderly, this experience isn't for you. You'll have to dig through a lot of merchandise to find "the deals," and you'll have to do it while being swarmed by other shoppers who are doing the same. Bring a pair of gloves to protect your hands from any unknowns that you may come across in the bins. Go when you have several hours to dig. Leave the kids at home, if at all possible. Goodwill Outlet locations are usually very busy, and the customers can sometimes get aggressive. Keep your finds close to you. People will shop out of your cart if given the chance. Shop often. New merchandise is put out throughout the day. Learn the rules. Some outlet stores make you stand behind a line while they put out new merchandise. Step over the line, and you'll have lots of people yelling at you. Goodwill Outlet Stores have a cash-and-carry policy, meaning you'll need to have a way to haul that big couch home as soon as you buy it. All items are sold as-is and cannot be returned or exchanged. Goodwill Outlet stores sometimes go by different names, including as-is stores, bin stores, and blue hanger stores. They're usually freestanding facilities but could also be attached to a regular Goodwill store. To see if there's a Goodwill Outlet store near you, use the store locator at the top of the Goodwill website. Just check the "outlet" box and enter your ZIP code or city and state. It'll return all the results in your area. Note that Goodwill Outlet locations have a red rectangle next to them. If there aren't any outlet stores in your area, your search will show all of the regular Goodwill locations, which are marked in blue.